Building on the success of the first Grounded Resilient Organizers Workshop (GROW) on climate justice for young adults in fall 2015, the UU College of Social Justice has scheduled a second GROW Climate Justice training for May 25-27, 2018 at Starr King School for the Ministry in Berkeley, California! 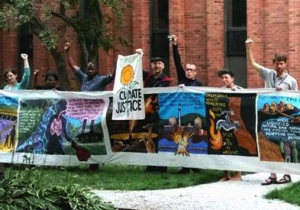 Join a group of committed Unitarian Universalist climate activists and invited guests at for a weekend of skills sharing, community building, and reigniting the flame for climate justice! This 3-day training, led by a practiced, diverse team of facilitators and community organizers, will be a young adult–centered space yet multigenerational, open to anyone 18 and older. GROW Climate Justice is for people passionately committed to addressing climate change and building justice and peace in all our relations. The workshop will focus on education and spiritual grounding for long-haul activism and community organizing with a values framework of collective liberation and decolonization. Climate justice movement history and foundations, strategies, tactics, and visions for a just transition to an equitable, resilient, and life-giving society will all be covered, as well as how to work toward climate justice using an intersectional lens. Young adults are able to attend for a reduced registration rate and 50% of the available spots are reserved for young adults. Applications are due May 1, 2018.